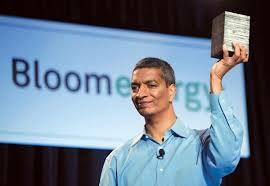 Musings 'n scribblings of a philanthrope .. : Energy and the Supply Chain - Bloom box ..
K R Sridhar's invention of the bloombox is set to replace the grid as it is cheaper than the grid - Bloom Energy Fuel cell, made from Silica available in plenty in beach sand . Click here for the video .. The major customers are FEDEX, Walmart, Staples, GOOGLE, EBay and other 15 major global customers. The modularity available in stack like configuration and the concept of the Bloom energy server, stacks of bloom boxes arranged one over the other and together can power the shopfloors and factories of the future. More power requirements mean just adding more boxes to form clusters, as simple as that. A cluster as big as a motor car can power a super market , 7 days a year for 365 days. The superior advantage of this technology is the availability of raw material of beach sand or silica which is easily obtained in different parts of the world near the oceans. Though the technology and the exact composition of the materials applied to both sides of the silica plate are proprietary, this technology can really make a difference if and when it can be brought to commercial application at the earliest. The deadly combination of oxygen and beach sand can produce energy as claimed by Mr. Sridhar ..